As you know, Blonde One and I are sometimes lucky enough to be sent items of outdoor gear to try out and review. This is obviously a very useful perk for two people who use their outdoor kit regularly and also need a fair few spares for the youngsters they work with. B1’s outdoor stores regularly benefit from outdoor kit that we no longer use ourselves and occasionally so do our family members but one person who has never yet been able to take advantage of our good fortune is Mr B2. This is usually an issue of size rather than gender, Mr B2 is a completely different build to me and can often be heard uttering the plaintive words, ‘Men’s small?’ as parcels arrive through our door. One item of outdoor kit that we can share however is socks, his feet are slightly bigger than mine but socks have a lot more stretchiness than walking boots. I was recently given two pairs of Stance walking socks and thought it was about time I did some marital sharing. 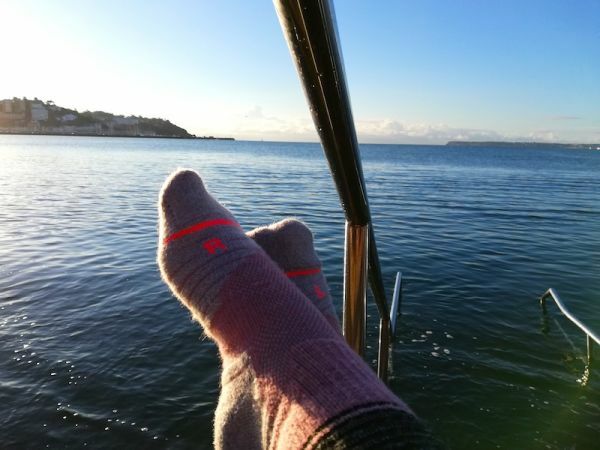 He gratefully accepted a pair but once I realised how comfortable, soft and cosy my new socks were, I had to work hard not to regret my generosity. I have worn them walking, gardening, sleeping and I have even taken them for a swim… well not quite but they are the last thing I take off before I get in the sea! PS If you are feeling sorry for Mr B2 don’t! He has recently taken deliver of a brand new custom built steel bike for his bike packing… now that is a piece of outdoor kit!